Ansumana was among the first interns of the academy. He spent about four years with the academy. Tall, studded Ansumana learnt a lot through out his stay with the academy and has now proved to be the academy’s leading goal keeper. 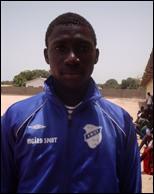 Described by pa Alieu Sanneh, the goal keeper trainer Ansumana is polite and always eager to lean new things. Moreover he is optimistic of rising to the highest level in the future. Ansumana’s fine saves makes him the best goal keeper of the local league and voted the best goal keeper by the players and coaches of the academy. He is fantastic at his age with Arial balls and has a great vision of distribution. These qualities makes him the first choice keeper in the Brufut’s team that went close took third in the just ended third division and went on trials in a First Division side Real De Banjul.